Doom metal drum loops with the heaviness of Sabbath but with a modern drum sound, Double Bass Mania V is the only source for true doom metal drumming, all in one brutal loop package with hundreds of sludge heavy grooves. A powerful, heavy and hypnotic collection of doom metal drum loops. With a tempo range between 25 and 60 bpm, we laid down the ultimate in doom, stoner, and sludge metal drums. If you’re after the agony of powerful live drums slamming away at unholy tempos, then this might be the right set of drums for your music. Sludge and Doom Metal Drum Loops. Thick, Heavy, Slamming. That is Double Bass Mania V.
We dialed the tempo way down for this thunderously heavy and hypnotic collection of doom metal drum loops. With a tempo range between 25 and 60 bpm, we laid down the ultimate in doom, stoner, and sludge metal drums. With a healthy mix of simple, straight-ahead drum tracks as well as insane double bass runs, Double Bass Mania V: Doom Metal will satisfy the insatiable thirst for heavy drum grooves with space as well as power. Double Bass Mania V: Doom Metal is for anyone needing heavy, ultra-slow and spacious drum loops to deliver the rhythmic backbone for your nastiest and sludgiest riffs. 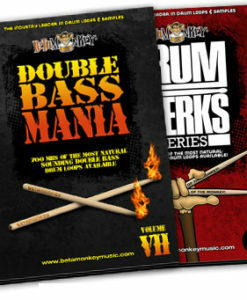 Single kick, double kick grooves, multiple loop variations, drum fills, and a matching drum and cymbal sample set, Double Bass Mania V delivers the sludge and dirge. The only metal drum loop disc of its kind anywhere, for anyone writing classic and modern doom metal, stoner doom, death doom, epic doom. 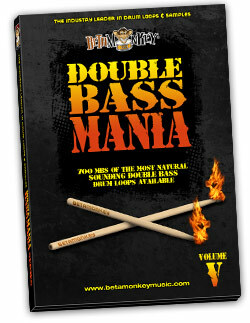 If you need it agonizingly slow and brutally heavy, Double Bass Mania V is the ultimate drum loops resource for your metal songwriting toolkit. The drums were developed by a wide range of doom metal bands. Start with the dirges and hypnotic jazz-influenced doom of Black Sabbath, and continue with the updated sounds of Candlemass and My Dying Bride. Doom metal is extremely sludgy and slow, but, above all, heavy. These heavy groove capture the hypnotic evil of slow tempos where the extreme sludge riffing can breathe. Fused the heaviness of Sabbath with a modern drum sound, Double Bass Mania V is the only source for true doom metal drumming, all in one powerhouse loop package with hundreds of brutally heavy grooves. Designed for Multiple Styles of Doom Metal, from classic Sabbath to modern sludge metal: Pure power and brutality, with a heavy emphasis on double kick grooves. Crushing, spacious, hypnotic – if you write doom metal or related styles, DBM5 is a perfect fit. Focused Range of Tempos: Ultra slow tempos from 25 BPM* to 60 bpm (*We achieved 25 bpm with half-time grooves at 50 bpm – many DAWs don’t go this low for project settings). Straight 4/4 Feels: All drum feels are quarter or eighth note feels, straight 4/4 time. If you need to let it breathe with the Black Sabbath inspired triplet swing dirge feels, you want Double Bass Mania VI. Cohesive Drum Sounds: All drum loops are from a single recording session (all grooves, fills, and samples are sonically-matched). Change tempos. Change feels. All loops on Double Bass V are 100% compatible and seamless to integrate together. Fully-Sampled Drum and Cymbal Samples: All drums and cymbals used in recording Double Bass Mania V are included as a multi-velocity sample collection. Add drum and cymbal accents where needed or sequence custom patterns in your sampler of choice. 818 (1.8 GB) original, license-free drum loops and drum/cymbal samples. All loops and samples are available in 16/44, 24/44 WAV, and APPLE (AIFF) format. REX2 format update to follow. 85 (100+ MB) multi-velocity drum and cymbal hit sample section. Includes all drums used as well as crashes, chinas, rides and hats. Available as a separate download after purchase. ALL ACIDized WAV, APPLE, and REX2 formats included with digital download or hard copy DVD. All my life went from glam metal, grunge, heavy metal, black metal…and finally stayed at Doom Metal who suits my music toughts perfectly…i must tell this Doom Metal Drum loops and Samples are high insipiring…not only because of the slow tempo which you can change at whatever tempo you want, but the sound is a resemblence of both new Epic Doom Metal and Classic Doom, i’ve only choose 2 or 3 samples and loops for my first project using them , and for the first time, i manage to compose a complete song in just hours…very insipiring indeed. Thick. Heavy. Swinging. That is Double Bass Mania VI. Think Black Sabbath swing but in a modern-sounding drum mix. That's the attitude here - swinging the heaviness and bringing the doom metal drum loops. All grooves have an undeniable swing that will unleash the most brutal of all triplets. Funeral, epic, doom? That's the vibe we captured in this drum loop package exclusively for all the doom metal artists out there. For doom, stoner, sludge metal. Sabbath-Inspired Doom Metal Drum Loops. The Return of the Beast takes it over the top with a relentless onslaught of fast and furious double bass grooves. With 800+ double bass grooves, groove variations, fills, one shots, and samples, Double Bass Mania II stands alone as the brutal choice for creating the heaviest of heavy metal tracks. With thousands of songs released with DBM2 grooves, this collection of metal is the original and continues to inspire new metal to this day. Speed Kills. Double Bass Mania III: Ultra Extreme Metal unleashes the fury with a tireless onslaught of the fastest and most brutal speed and death metal drum grooves. With 666+ double bass grooves, variations, fills, one shots, and samples, Double Bass Mania III delivers the pain that frightens other sample libraries. Insane metal drum loops for modern death, deathcore, djent grooves with a powerful, high-definition drum mix, Double Bass Mania VII is the collection you want if you write loud, intense modern metal. Pure metal drums for all forms of modern heavy music. It's time to get the brutal grooves your metal drum tracks deserve. Complete multi-velocity drum samples included. Power metal drum tracks where it is all all the heavy groove. Slamming, powerful, hard-driving grooves with straight, syncopated double kick drumming - a massive collection of pure metal power. If you write anything like Pantera, Exhorder, Sepultura, Gojira (among others in the genre), these are the heavy drums you've wanted. Over 1,100 pounding, aggressive double bass grooves from 90 bpm to 120 bpm. Speed, deathcore, tech metal, djent... pick your poison! Over 900 metal drum loops to create powerful metal drum tracks. Pure heavy metal drum loops for speed metal, deathcore, death, tech metal, djent. 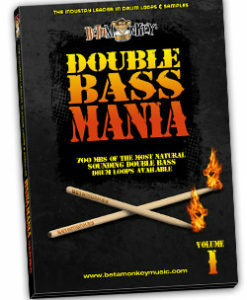 Part of the one and only Double Bass Mania Series! Pure classic heavy metal on this all-new re-release. Double Bass Mania I: Reloaded captures the attitude and energy of classic metal and the power and precision of modern metal genres with 1300+ loops covering tempos from 30 bpm to 280 bpm. Inspired by Metallica, Slayer, Anthrax, Megadeth, Pantera, Lamb of God, Gojira, Whitechapel, All Shall Perish. Create new metal drum tracks with live, powerful drums.